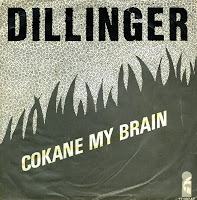 Dillinger was born as Lester Bullock on June 25, 1953 in Kingston, Jamaica. In the Seventies he started working with producer Lee 'Scratch' Perry, who suggested his stage name, after gangster John Dillinger. In 1977, he recorded 'Cokane in my brain', a track that relied heavily on the main tune from 'Do it anyway you wanna' by The People's Choice. It became a number 1 hit in the Netherlands, where Dillinger was hyped somewhat by the weekly Hitkrant publication. They published stories like 'Does Dillinger even exist?' when he didn't turn up for a TV performance. Dutch artist Dingetje recorded a parody of this song, entitled 'Ik ga weg Leen'.